The graphs of f(x) and g(x) are shown. Use these graphs to find (g ○ f)(3). Since (g ○ f)(3) = g[f(3)], we first must find f(3). On the graph, locate f(3). That is, find the y-value of f when x = 3. From the graph, we see that when x = 3, y = 6. Thus, f(3) = 6. Now, use 6 as the input for g(x). That is, find g(6). 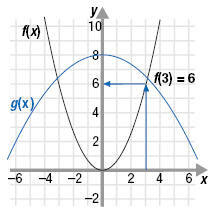 To do this, find the y-value of g when x = 6. From the graph we see that when x = 6, y = 2. Therefore, (g ○ f)(3) = 2. 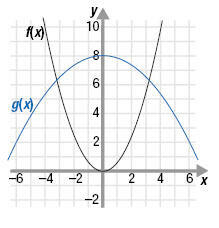 Graph the function f(x) = x2 - 2. If g(x) = |x|, sketch the graph of (g ○ f)(x). The graph of f(x) = x2 - 2 is the same as the graph of f(x) = x2 but shifted down 2 units. Now, find (g ○ f)(x). Replace f(x) with x2 - 2. In g(x), replace x with x2 - 2. The graph of g(x) = | x2 - 2 | is the same as f(x) = x2 - 2 except that all outputs are nonnegative because of the absolute value symbols. 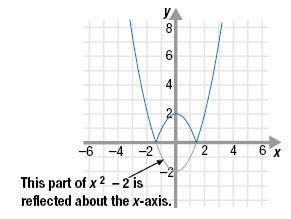 To graph (g ○ f)(x) = | x2 - 2 |, we can reflect across the x-axis the part of the graph of f(x) = x2 - 2 that is below the x-axis. 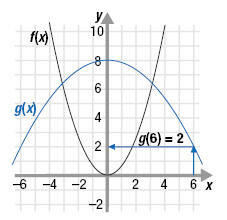 The graph of (g ○ f)(x) = | x2 - 2 | lies on and above the x-axis.